I've been expecting this for a while now. But like many other things in parenting, home education and life, I knew all I could do was to 'leave the door open,' wait for him to come to me, and then guide ever-so slowly and patiently. And let him to take the lead. So, earlier this week, when Calvin came to me with a drawing of a costume (in the foreground of the photo), and said, "I want to make this," I was rather caught off guard. Half-thinking, and half on parenting auto-pilot, I said, 'Well, lets eat breakfast first. And then I told Ezra we'd paint. And then..(blah blah blah)...and so maybe tonight when you go to sleep I could work on it, or Saturday afternoon might be better." "No, Mama. I want to make this. I want to sew it. I drew a picture of it, and I looked at the costume book, and I know I can do it." "Oh. Oh! YOU want to sew it! Oh! Well, you could do that. I could get you set up for that this morning", I sputtered out as I quickly gathered my wits and slowed down my excitement before it turned him off from the idea completely. So that's what we did. 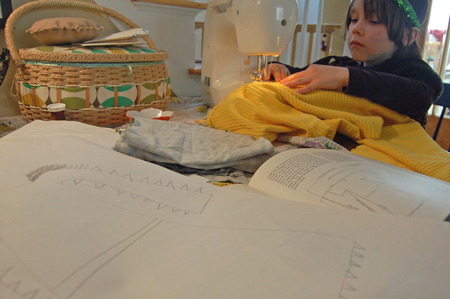 I brought down my old sewing machine, and plopped it right down on the same table where it had lived for years before I had my studio, where I sewed with it day in and day out of his early years as a babe. The same machine that my grandmother gave to me, and on the same table that my great grandmother - a seamstress herself - sewed every single day. His great - great grandmother. And then before I got swept up in a sentimental ride of it all, I was brought right back down to reality by a six year old learning something new. 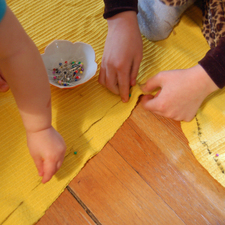 Needles to thread. And rethread. 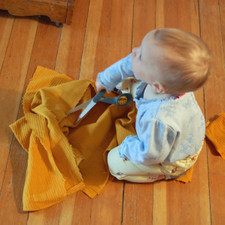 A baby to keep occupied (by 'helping' with scissors and pins, naturally). 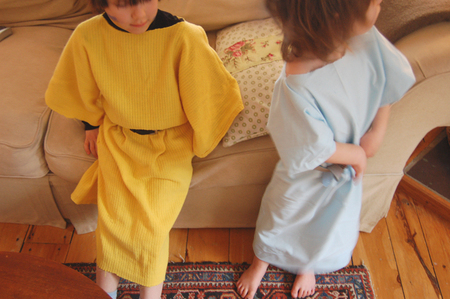 And as little explaining as I could manage to give from my corner of the room where I chewed my fingers like a nervous mother, where I worried that clothing might not be the best 'first' sewing project. But I know this little guy well enough to know that too much instruction will completely turn him off (hmmn...I don't know where he gets that), and that he wouldn't begin to attempt something until he'd studied, watched and thought about it a good deal already. Which apparently is just what he's been doing, because he really did know just what to do. He traced a tunic he wanted for the shape, pinned it together, and asked me to 'draw a line' where the sewing should be (a brilliant idea, I thought), and then...he had a costume. 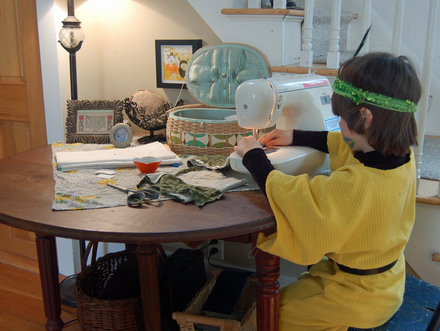 But, being that one tunic does not a theatre troupe make, he went right to work on one for his brother (Tiger Lily and Wendy, in case you're wondering).